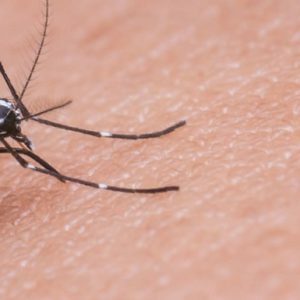 There are two main groups of mosquitoes, the Culicine mosquitoes sit with their bodies parallel to the ground, the Anopheline mosquitoes sit “nose-down” to the surface, and have dark spots on their wings. Mosquitos on holiday, especially in the tropics, can transmit yellow fever, filariasis, dengue fever and malaria. Even in Britain, mosquitos cause itchy bites with a red swelling around them. Near estuaries or marshes, Anopheles maculipennis – a brownish species with small spots on its wings – is fairly common indoors. It bites readily, especially at dusk. The most common species indoors, often misidentified as a Gnat, is Culex pippins which does not bite but is almost indistinguishable from Culex molestus which does. Mosquito lay eggs in stagnant water, the small brown larvae hang from the surface of the water, turning into comma-shaped pupae in four to ten days. Within two days the adult forms will emerge hungry for blood. The females are the only ones that will feed and require a blood meal before they can lay their eggs. Adult female mosquitoes generally hibernate in dark corners of houses and sheds and other sheltered sites. The best way of dealing with mosquitoes is to use insect repellant. The most successful are those that contain diethyltouamide (DEET) this is probably the most effective chemical repellent available and it also has a good safety record. Studies have shown that a repellent containing around 20% DEET will protect the wearer for up to 5 hours. Weaker formulations of 10% or less are safe to use on infants from the age of 2 months and up. Plant based chemicals are also available and can offer some protection against mosquito bites. While not as effective as DEET and not recommended as the only protection in areas that are susceptible to malaria. Ingredients include citronella and lemon eucalyptus. If you are dealing with mosquitos at home then PESTUK can help. We will spray a residual insecticide to the property and look for the cause of the problem and advise how best to deal with them, and prevent further problems. We are full members of the BPCA, the governing body for professional pest control companies in the UK. Our technicians are fully trained, insured and CRB checked. Please call us on 0330 100 2811 to book an appointment.